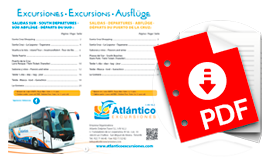 Atlantic Dolphin Travel is a tour operator (I-AV-0000092.2), which offers a personalized and unique service to his customers. Founded in 2000, Atlantic Dolphin Travel prominently between Tenerife travel agencies, for its strong, dynamic and modern infrastructure. Our company is equipped with the most modern computer structure and media. Also, Atlantic Dolphin Travel has a team of young professionals and ntrepreneurs with extensive experience in the world of tourism, has several specialized departments, among which are the excursions for groups and individuals. Atlantic Dolphin Travel organizes all kinds of leisure activities complementary to stay on the island of Tenerife. Our main objective is to offer the best service to our clients. We provide the Customer Service 365 days a year, where they will meet your demand and advise you on the best option at your request. We are also available to help you through our Contact Form.